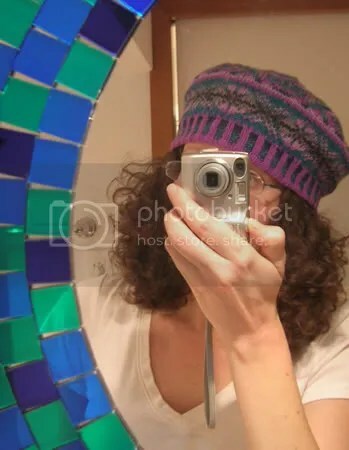 I have been underestimating the skill it takes to stand in front of a mirror and get a good picture of yourself wearing knitted things. Here I thought, hey! 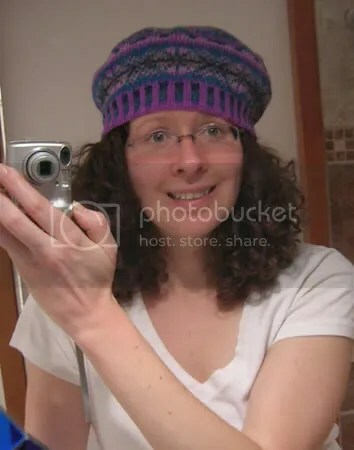 Just put the hat on and click, how hard is that? Pah-HAH. In the interest of full disclosure, I will tell you the reason the hat is folded over is so that I can avoid showing you the horrific charting error I did in the middle of the 5th repeat on the rosette pattern. I am confident that Average Person Walking Down The Street will not notice, though, which is why I did not feel compelled to rip out my 8 colours of yarn to fix it. But ta da, December Lights Tam from the Holiday Interweave Knits. All in all, a lovely pattern. Super quick knit and a beautiful product. I am just happy the colours I chose worked out, I’d hate for it to turn out like some weird mottled mess. My only other modification besides colour was that I did the whole thing on 3.5mm instead of 3.25 and 3.0 mm as the pattern says (I think), to make the band a little looser than an 18-inch head-circumference and to come closer to gauge requirement. 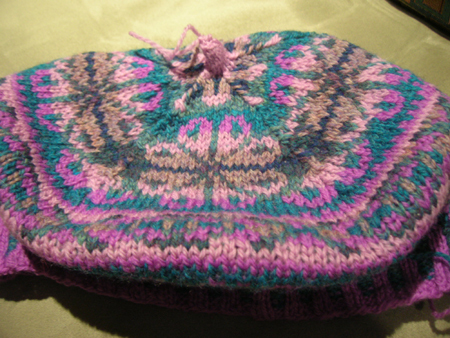 It was good practice on multi-colour fair isle, seeing as I’m itching to cast on for Venezia still (IK Fall 2006). I am STILL hanging on to Venezia as my reward for finishing my draft, and with my stash as my witness, that will happen before next weekend. It has to. I am not carrying this on into another month, I am so close. I am also looking forward to the time when I can knit something new, something that is not an enormous blanket (or a thesis draft). These small little suckers are awesome instant gratification. Why did I forsake hats and gloves and mitts and toys? They are the best things ever. This is, in fact, a bee for Bea. Knitted cat toy courtesy of Christine Landry’s free pattern, great for using up a bit of ACK-rill-ick still lingering in the stash and soothe wee kittie brains with a bit of catnip at the same time. I placed the finished bee on the carpet and she promptly sniffed it, then clutched it and rolled around for a proper greeting. Awesome. Happy Wednesday, my friends! May your knitting be close by. 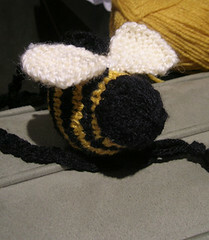 what a cute bee – I’m bookmarking that pattern! Tam is Gorgeous, and Stunning and Beautiful! Love the colours and it’s all of the above on your curly locked noggin. That bee is so cute! The Tam is lovely! I sort of like the cropping of the mosaic mirror in the frame too. Lovely tam. I think it looks better in your colors than those in the magazine. I’m actually considering knitting it now. Glad Bea liked her Bee. Are you planning on buying her the B Movie when it comes out on DVD? Great Tam! I love the colours. 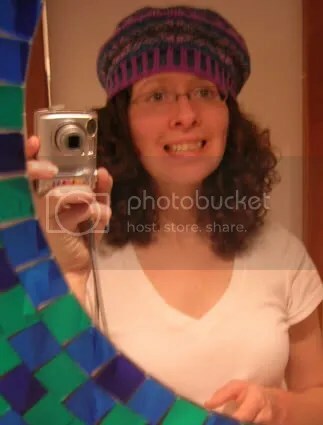 The photos are most amusing (though that first one really is good), and make me glad to know I’m not alone in having a difficult time self-photographing hats! 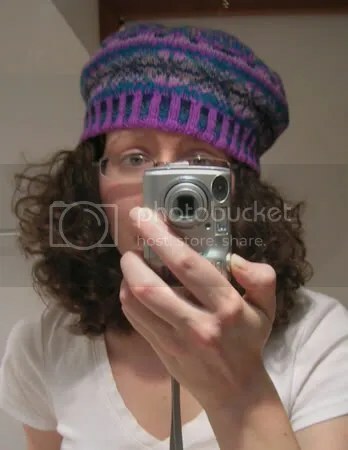 Who knew that becoming a knitter would also make one need an on-hand photo-stylist? Bea with the Bee would be sooo cute!! I just now went through the whole pictures-in-the-bathroom thing myself. True, cameraphone pictures are crappy quality, but it always seems people look the most photogenic in them. How is that. Bah. It’s like photo booths at carnivals. You have GOT to take a picture of Beatrice with the Bee. Too cute. All of my photoing efforts seem to end up like this! The tam looks fab and the colours look wonderful together. Gorgeous tam! Well done. I’ll be sending good thesis-finishing thoughts your way. It CAN be done, although I wouldn’t have believed it myself a month ago! I think this is my thrid attempt to leave a comment on this post- for some reason, they just aren’t sticking! It seems bit late to say it now, but I love the colour varigation between the ribs on your tam!! And the bee for Bea- well, that’s just too cute for words! And good for you for taking a snow day (in the newer post). Sometimes we need those mental breaks just to give that last push. Beautiful beautiful tam! Yay snow day!